It was the term “minimal human interference” that was most enticing. People fly from all over the world to places like Namibia, Botswana and Mongolia just for their remoteness. 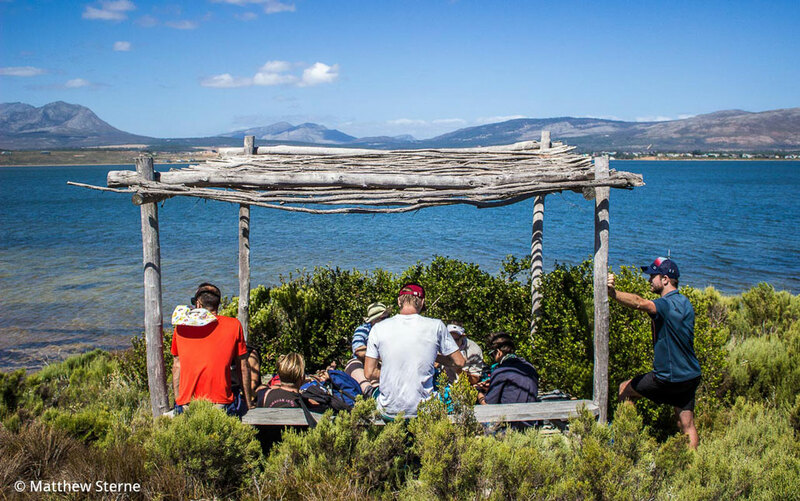 With a one-hour drive from Cape Town, we could potentially find a similar wild experience. A little further research revealed a two-day hike called The Highlands Trail. 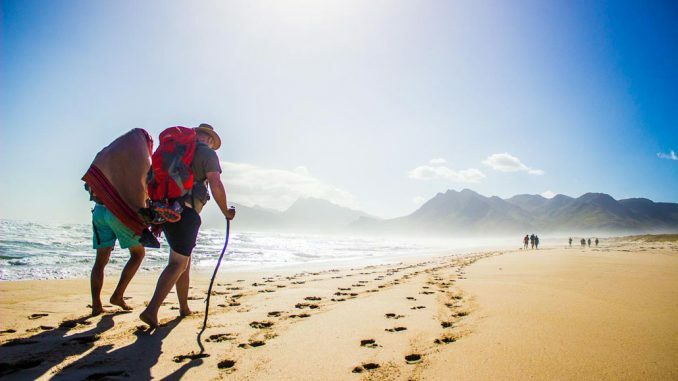 It’s a 42km trail that, on the first day, skirts the outside of the Kogelberg Nature Reserve passing through diverse fynbos, past an estuary and a long stretch of beach. The second day climbs up above Kleinmond and into the mountains. 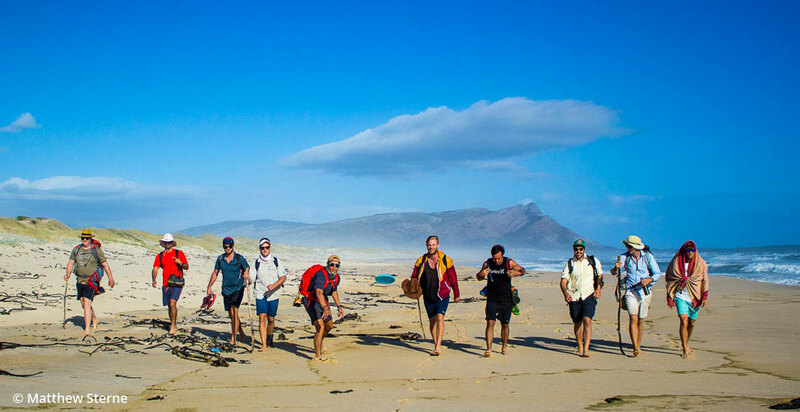 It sounded too good to ignore, so we rounded up a crew and set off to explore this local wilderness. 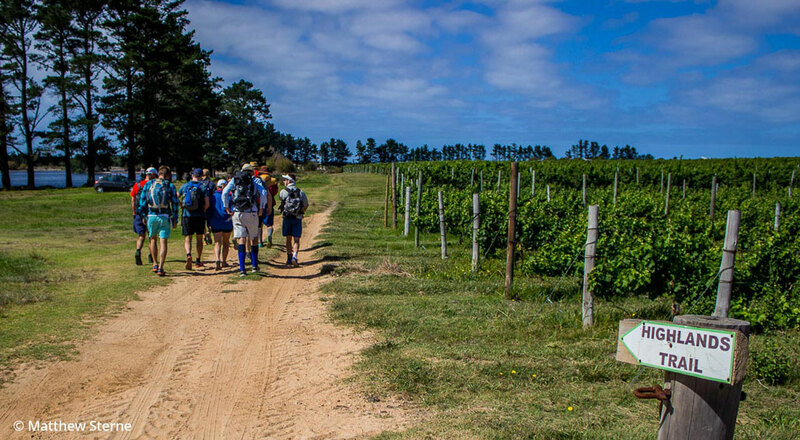 The hike starts at Iona Wine Farm above Arabella Golf Estate. 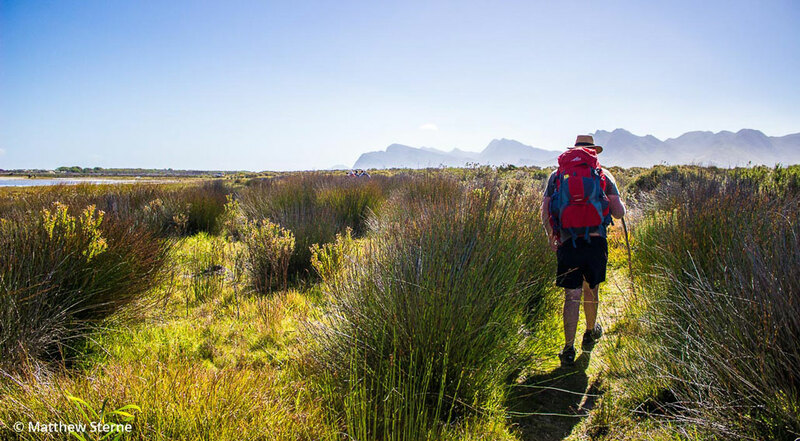 One of the perks of this hike is that you can leave your car and other belongings at the hut in the Kleinmond Caravan Park, then take another car to Iona, 12 km away, and start walking. All you need to carry is a small daypack containing lunch, snacks and water. 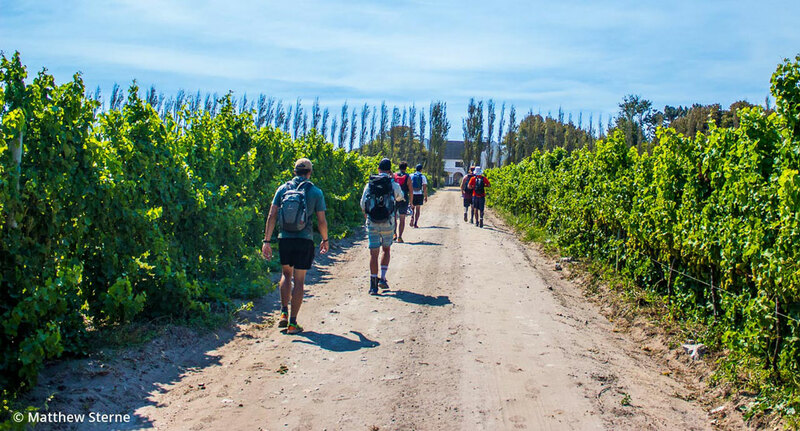 We started hiking in clear sunshine, passing between a dam and vineyards. 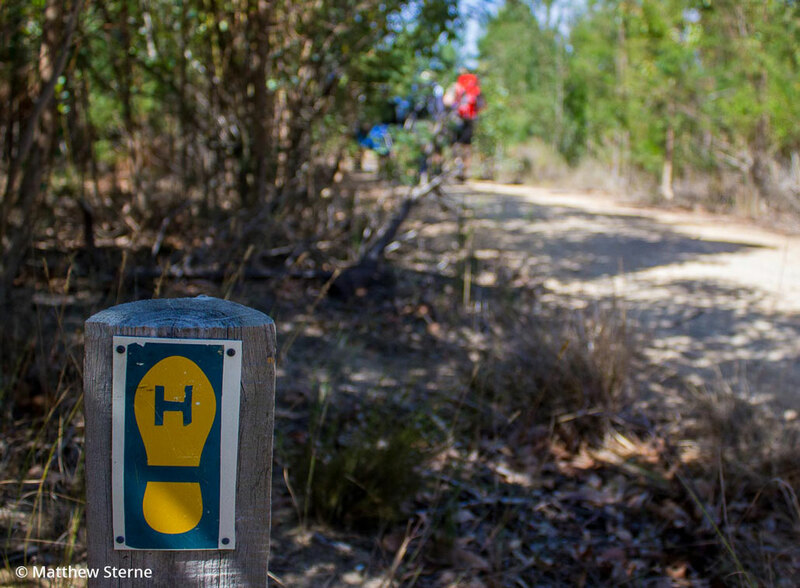 The trail starts off well-marked at each intersection with signs such as this one with the tell-tale ‘H’. Later on, however, there are stretches where the path isn’t so obvious. 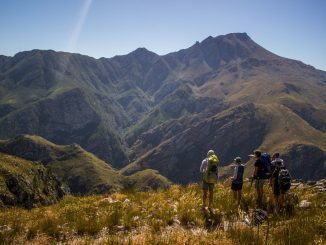 I don’t think we would have found our way so easily if it weren’t for Mike Lundy’s Weekend Trails in the Western Cape, which has detailed directions of the hike. 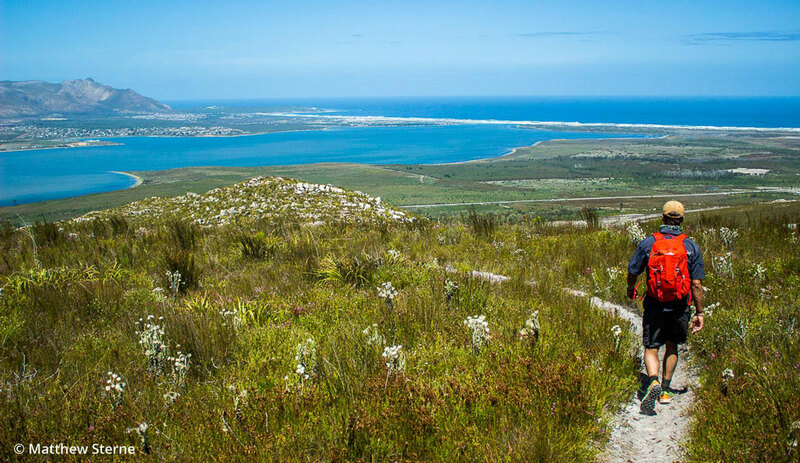 After a couple of kilometres we reached the viewpoint looking over towards Kleinmond and the mouth of the Botrivier. We then entered a patch of wilderness with incredible pink and purple fynbos. 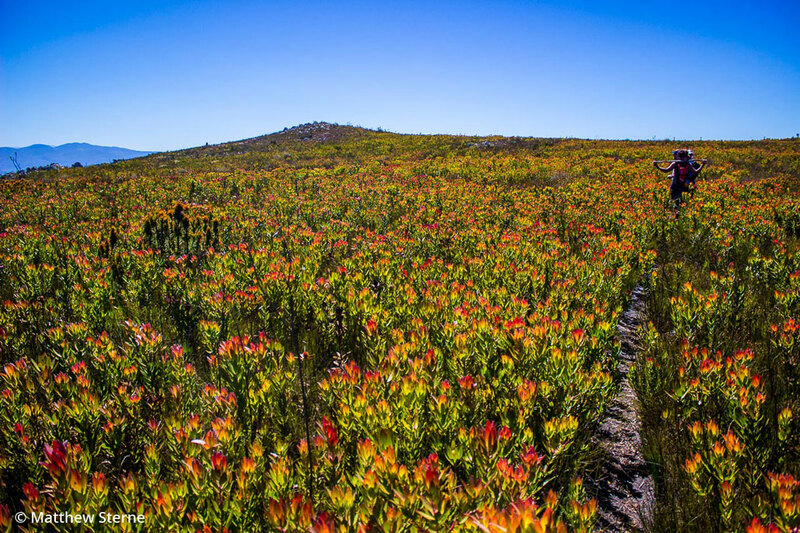 Thin blackened tree trunks that looked like burnt matchsticks popped up amidst the vivid fynbos. We followed a sandy jeep track through this striking landscape. 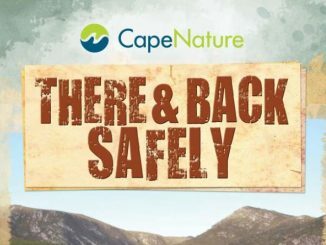 The path eventually became a track that sloped down towards the Botrivier estuary, with Fisherhaven on the far side of the water. We had reached our high point for the day and the rest of the day’s path would be downhill or flat. We still, however, had a long way to go. There is very little shade on the hike. In fact, over the two days this was the best shade we found and that’s not saying much. Nevertheless, it made for a great little lunch spot to rest and soak up the solitude. Rejuvenated from the lunch rest, we walked through the wetland next to the estuary where we passed a bird hide and six wild horses. These horses are part of the local lore and fanciful rumours are passed around about their origin. They either survived a shipwreck, escaped an abattoir, or were part of a boer army camp that hid in the mountains over a hundred years ago. Whatever the case, they make for a beautiful scene on the banks of the estuary. We walked for 4 km on the beach towards Kleinmond and didn’t see another soul. As the sun dipped lower in the sky we ambled slowly along, avoiding the sea because of strong currents. 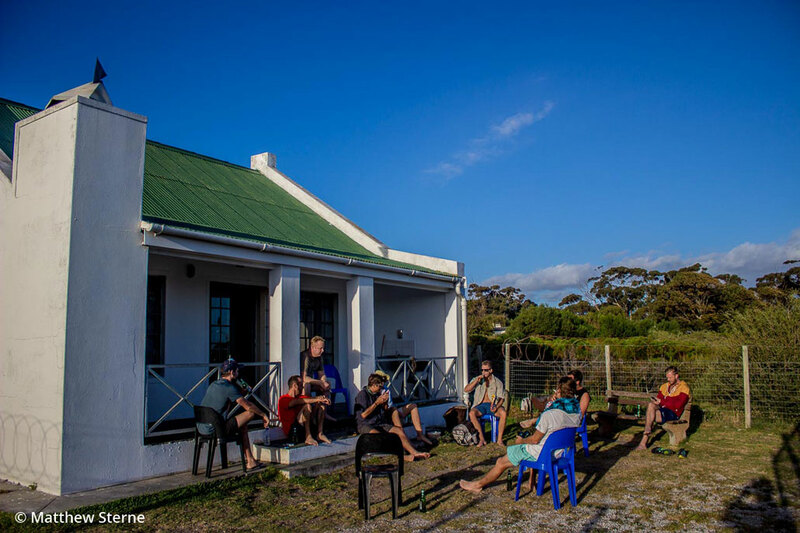 Eight hours after starting the hike, we arrived at the Frank Robb Hut in the Kleinmond Caravan Park. The hut is very basic with ten beds, a fridge, a microwave, a braai and an outside sink. The showers and toilets are 600 metres away. But with a cost of R90 a night per person, we weren’t complaining. In fact, we were pretty darn happy. 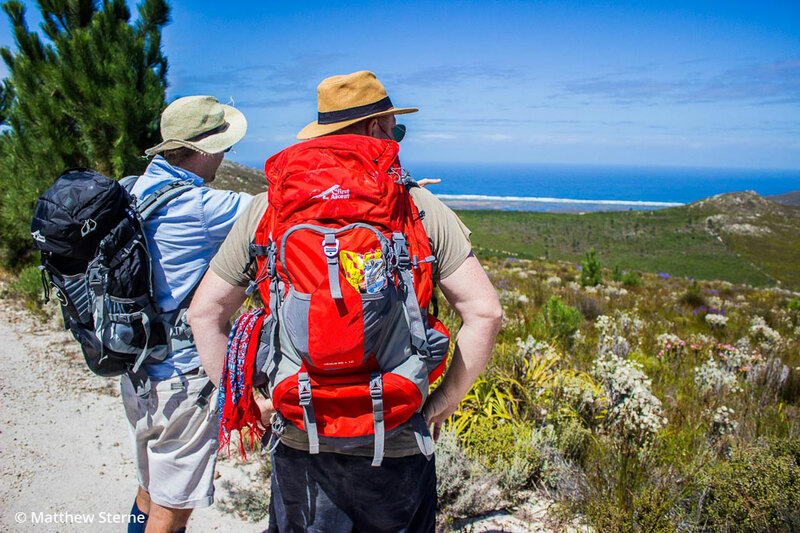 We started the second day by climbing a short path behind Kleinmond and re-entered the Kogelberg Nature Reserve. We followed a contour path for about an hour and stopped for a snack at a bench where we could see the start of a soccer match far below us. The contour path hooked around the Three Sisters Peaks and into the reserve. We now entered the best section of the hike as it started to feel like a true wilderness. Here we walked through a small section of burnt fynbos, a hallmark of many Western Cape Mountains. 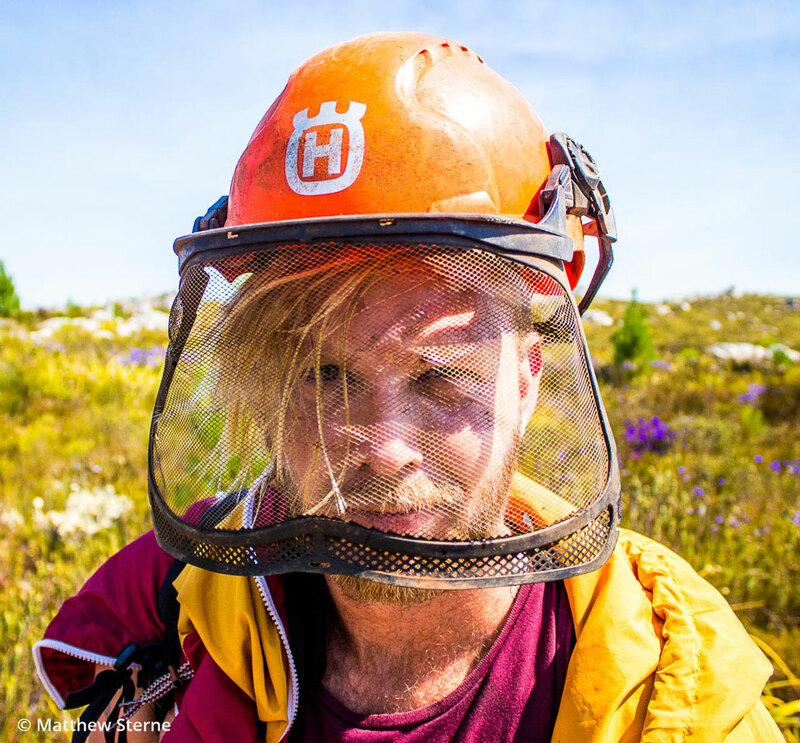 Further on we found even more evidence of a past wildfire – a discarded fireman’s helmet. 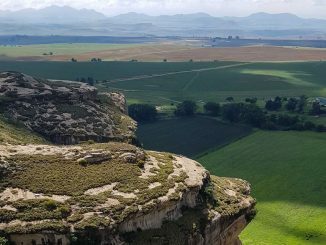 We reached the top of Paardeberg for lunch and rested here looking out over Elgin, Grabouw and the Hottentot Holland Mountains. Shade, yet again, proving hard to come by, but the views more than making up for it. 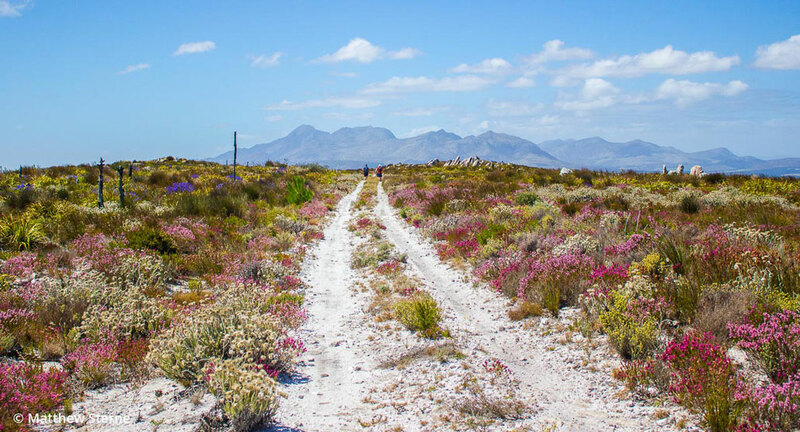 After our lunch on Paardeberg, we enjoyed a leisurely stroll on a plateau where we were surrounded by a diversity of fynbos that has been described as one of the best in the fynbos kingdom. We were lucky enough to have a range of wildlife sightings over the two days. 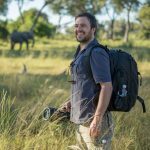 Driving past Gordon’s Bay on the Saturday morning, we saw a pod of dolphins and a troop of baboons, and on the hike’s first day we saw blue cranes, a pair of black eagles and those wild horses. 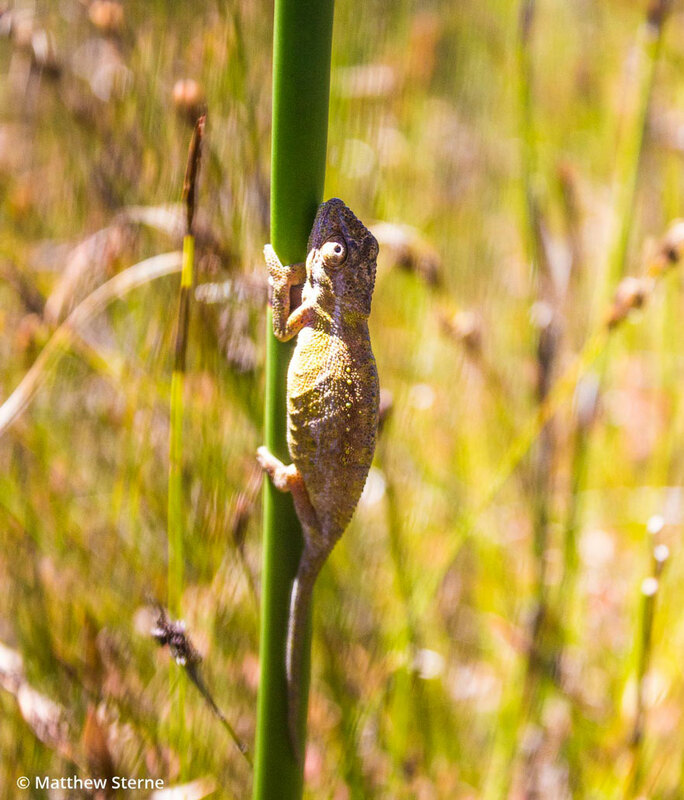 But this tiny chameleon, that one of us was lucky to spot on a blade of grass as we walked past, was perhaps the highlight and a delight for our entire group. An hour after lunch we reached a jeep track that we followed down the mountain for 8 km, completing the final leg of day two’s 20 km hike. Late in the afternoon we arrived back at Iona Farm and our cars. All in all, the hike is long but not too strenuous so it’s not a bad one to introduce non-hikers to. 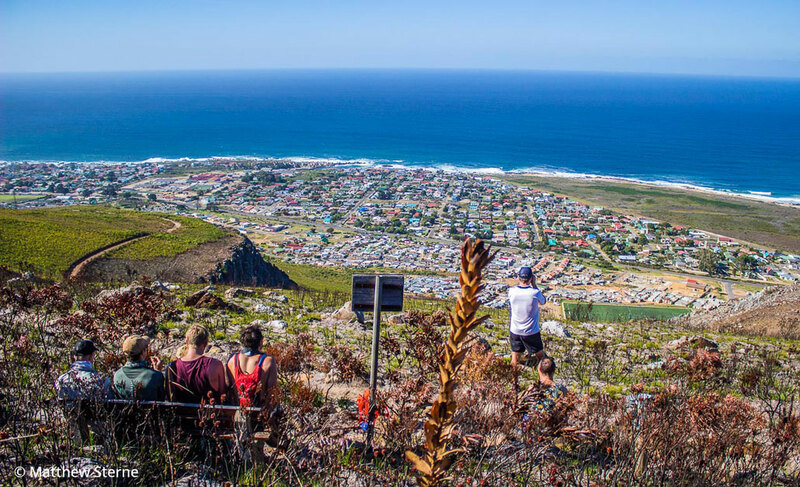 The diversity of the views and vegetation make it a really enjoyable hike as well as being affordable and accessible.